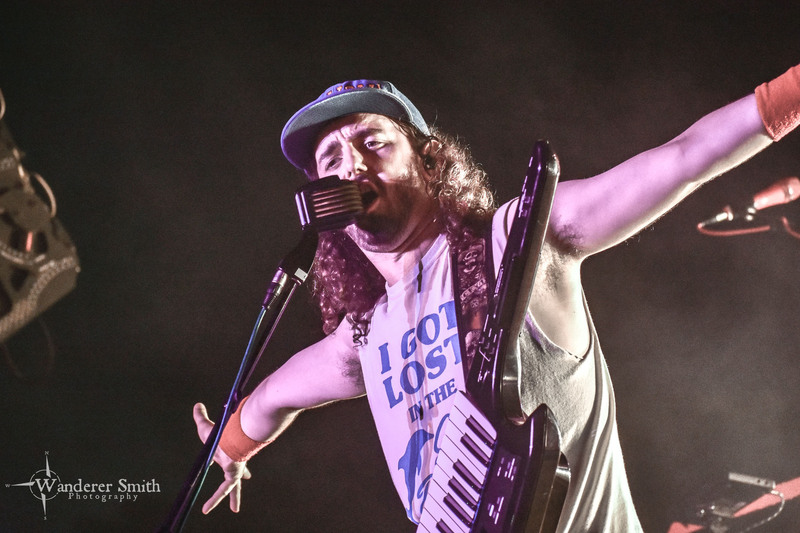 Pirate metal masters Alestorm brought their headlining tour to Gas Monkey Bar and Grill. This time the band brought their fantasy metal friends from outer space, Gloryhammer, with them as direct support. It was only fitting that the day brought a constant mist that turned to rain and soaked the crowd as they drank themselves into oblivion. With the crowd dressed in full pirate garb as far as the eye could see, even for the one local supporting act, Sworn to the Sword, the night promised to be a memorable one. I’m not sure I’ve seen a larger crowd at Gas Monkey Bar and Grill on any night of the week. Gloryhammer @ Gas Monkey Bar n’ Grill. Photo by Corey Smith. Gloryhammer was founded by Alestorm frontman Christopher Bowes in 2010. That’s all the information you need to know that the band would be over-the-top in the best possible way. Even though Christopher still plays a huge part in the band, he doesn’t perform live with them. Gloryhammer took the stage as the relentless drizzle poured from the skies. This must have felt like home for the symphonic power metal warriors from outer space. The band was dressed in full costumes and armour with each member representing a character from their fantasy concept story. The set started with “Infernus Ad Astra,” a short intro that set the galactic tone for the remainder of the show. The intro then transitioned to the track “Rise of the Chaos Wizard.” This is a track that immediately demonstrated the band’s talent. Symphonic keyboard patterns, layered perfectly with fast-paced guitar riffs, helped create a clean and unique sound. For me, vocalist Angus McFife (Thomas Winkler) stole the show. McFife displayed a wide range of high and low operatic frequencies. Not only was the band extremely unique with their brand of power metal, they displayed unbelievable musical talent. It was evident that Gloryhammer has a cult following as the crowd sang along to what seemed like every song of the set. The set consisted of songs from both their 2013 release Tales from the Kingdom of Fife, as well as from their most recent 2015 release Space 1992: Rise of the Chaos Wizard. The band fed off the crowd and kept the energy level high throughout the set. With such a great response for their first ever US tour, I have no doubt that Gloryhammer will continue to rise to the top of the power metal podium. When the giant inflatable duck was uncovered on the stage, the fans knew it was time for Alestorm. This was the first time that the band has toured the US with their own sound engineer and it seemed to help the live performance immensely. Out of all of the times I’ve seen Alestorm over the years, this was by far the best they have sounded. The headlining tour continues to support their most recent release, No Grave But the Sea. In true Alestorm fashion, the set began with a house-music dance intro that led into the track “Keelhauled.” This was the perfect set opener and instantly turned the packed crowd into a giant mosh-pit of singing and dancing pirates. A crowd of pirates slamming into each other while singing songs and drinking tankards of ale is something that you need to experience in your life. Alestorm @ Gas Monkey Bar n’ Grill. Photo by Corey Smith. Christopher Bowes led the charge on stage with his classic keytar rhythms and dancing high-kicks. Elliot Vernon (keyboards) mesmerized the crowd throughout the night with his effortless solos that were blended seamlessly into the mix. The rhythm section of Gareth Murdock (bass) and Peter Alcorn (drums) sounded as tight and heavy as ever. The newest addition to Alestorm is Máté Bodor (guitar). Also known as Bobo, Máté is said to be the best guitarist in Hungary. When you see him perform live you’ll know why. Absolutely flawless solos echoed through the venue as Máté delivered a captivating performance. The band continued through the set with tracks, “Over the Seas,” “Nancy the Tavern Wench,” and their cover of Taio Cruz’s “Hangover” – just to name a few. Hangover brought out the band’s guitar and drum techs who helped them pull off the expertly crafted cover. Alestorm is a band that doesn’t take themselves too seriously. At the same time, they are one of the most professional bands that you will see live. Alestorm continues to put on one of the most entertaining concerts and somehow seems to sound better each time. Do yourself a favor and catch these guys on tour, you won’t be disappointed.